I purchased enough fabric to use the owl print as a solid backing, the brown leaves as binding, and still have a 1/2 yard of each of the 5 materials left over to create a pieced top. I found inspiration from Nicole @ mama love quilts. You can see the quilt that inspired me here. I looked around, and Nicole did not have a tutorial on this quilt. Her style was definitely more improv than where I landed, but after some quilty maths to think about the amount of fabric I had on hand, I quickly settled into a plan. If you would like to re-create this look, below is a tutorial on how I created a 38″ wide by 42.5″ long pieced baby quilt top. **One note about the sashing material you select: I recommend a 44″ WOF fabric. Once the piecing for the blocks are done, they will measure 42.5″ long, so if your WOF is shorter than 42.5″ you will need more sashing than a half yard and the sashing will need to be pieced to be long enough. 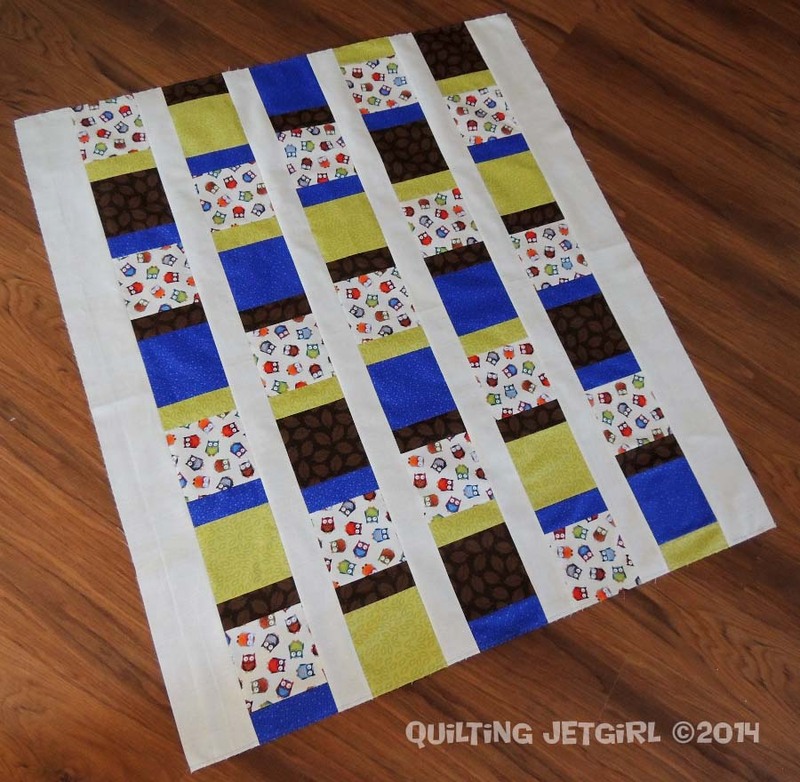 OR you can choose to not use one of the 2″ by 5″ rectangles in each column and have a slightly smaller quilt. From the 1/2 yard sashing, cut 2 strips that are 4″ wide by WOF (width of fabric) and 4 strips that are 2.5″ wide by WOF. From the focus print, cut 3 strips that are 5″ wide by WOF. Subcut the strips until you have (17) 5″ by 5″ squares. From each of the accent fabrics, cut 5″ wide strips (2 strips that are 5″ wide by WOF if you are using full width material or 3 strips that are 5″ wide by 22″ if you have a fat quarter). Subcut the strips to get (6) 5″ by 5″ squares and (12) 2″ by 5″ rectangles for each accent fabric. 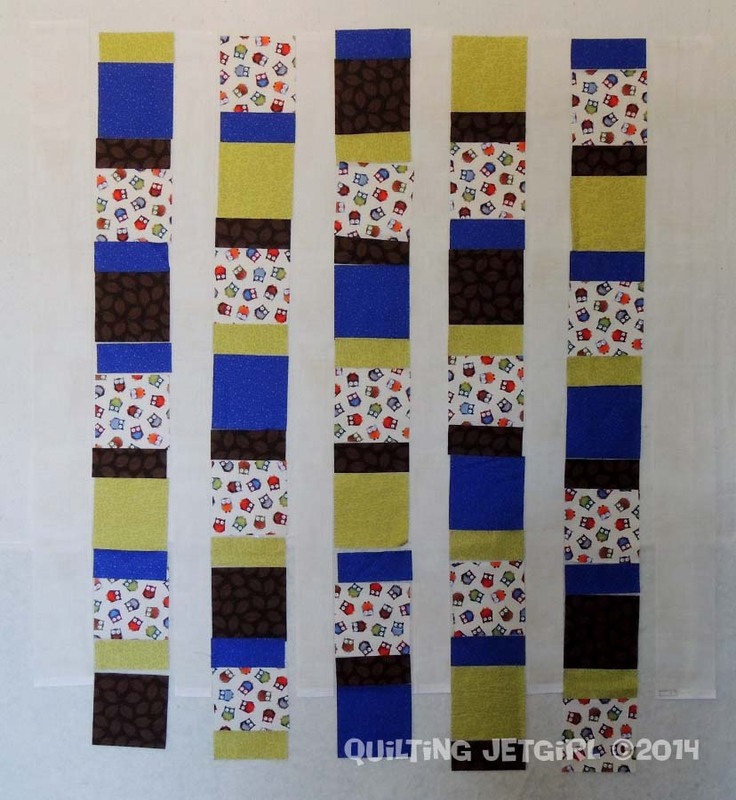 I placed my sashing on my design wall (the 4″ wide strips on the outside edges) with 6″ spaces between each WOF stripe so that I could then play around with laying out the blocks in between. The aim is to get (7) 5″ by 5″ squares and (7) 2″ by 5″ rectangles in each column. I chose to alternate the starting block as either the rectangle or square to add a bit of movement and interest. As you can see in my layout photo, the sashing blends right in with my design wall backing, making the sashing really hard to see! When laying out the blocks, they will be longer than the WOF of your sashing. This is OK because the seams will shrink those right up to fit (as long as the sashing WOF is larger than 42.5″). 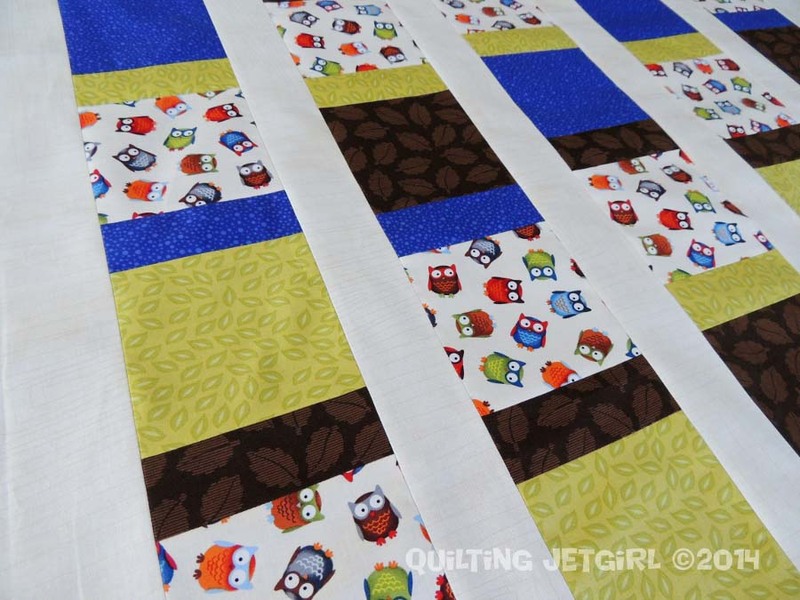 Once you are happy with the layout, piece the columns of blocks together using a consistent 1/4″ seam allowance. The pieced column should measure 42.5″ after piecing. I measured and trimmed as required. Sew the columns of alternating sashing and pieced blocks together, and voila! A cute and fast baby quilt top! It took me 2.5 hours to plan, cut, and piece this quilt top. Other ideas: this would be a beautiful scrappy quilt. 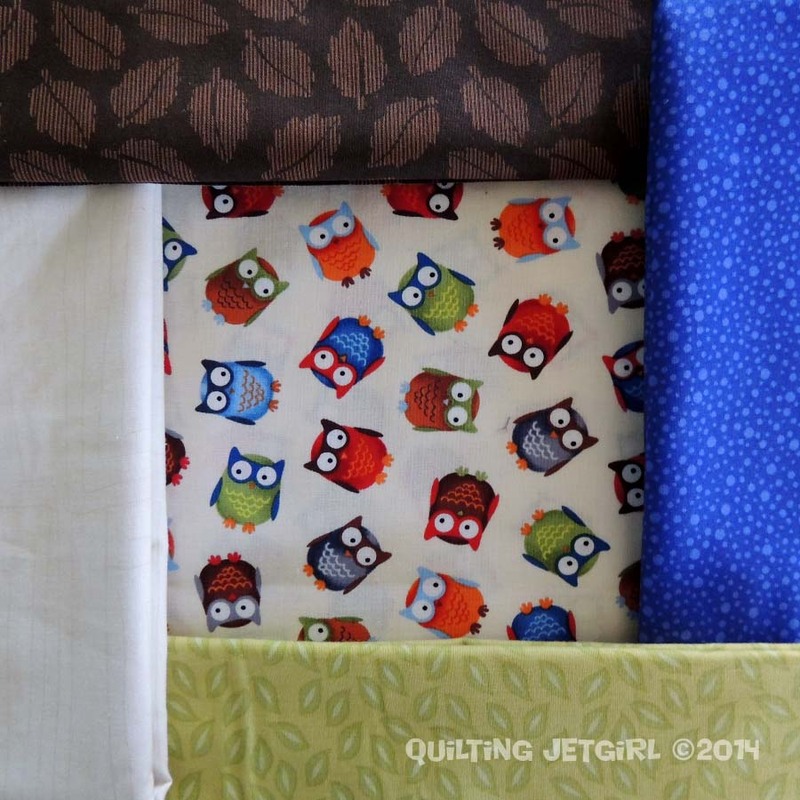 I was purposefully thinking about charm packs when I selected 5″ wide blocks. 5 fat quarters of coordinating fabrics are also enough to make the pieced columns if you don’t want to use a focus fabric. Just be sure to cut (35) 5″ by 5″ blocks and (35) 2″ by 5″ rectangles. If you have a lot of fabric on hand, this is a great pattern to play around with a bit of improvisation like Nicole used in her quilt top. Cut your WOF strips and then subcut into lots of varying sizes (from 1″ wide to 5″ wide) and have fun experimenting with a more free form layout! Please let me know if you have any questions or run into any problems with this tutorial, and I’ll update this post with anything I may have left out originally! I have recently struggled a bit on the blog technical side. For about a day and a half I was not getting email notifications about comments on my blog. I could tell I was getting comments, but no email notification was showing up. WordPress was doing its job; GMail just decided the emails were spam. I think I have that issue resolved for now, but if you are missing comment notification emails, you might want to check your spam directory. Also, I follow my own blog on Bloglovin’ to see how my posts display there. Sometimes the photos have been tiny. Sometimes there hasn’t been much text. And recently, there has be no photo at all! After realizing that I do have the ability to problem solve, I did a quick Google search and found this helpful article: Ultimate Guide to Bloglovin’ Blog Tips. My blog is hosted by WordPress, and I needed to change a setting on my Dashboard > Settings > Reading from Summary to Full text. So hopefully if you are a Bloglovin’ follower, things should look better from now on (fingers crossed). I agree with Vera – Super Jetgirl! :). Love the owls. Quilty math wears me out, I’m still working on the dresden flower quilt. On the tech side, I have never received email notification of comments other than pingbacks. Not sure why I would get those notices but not a notice for comments?? I’m using a self-hosted wordpress site and am still trying to figure it out…..
Great tute! Thank you for the bloglovin’ link…that was very helpful to me too. 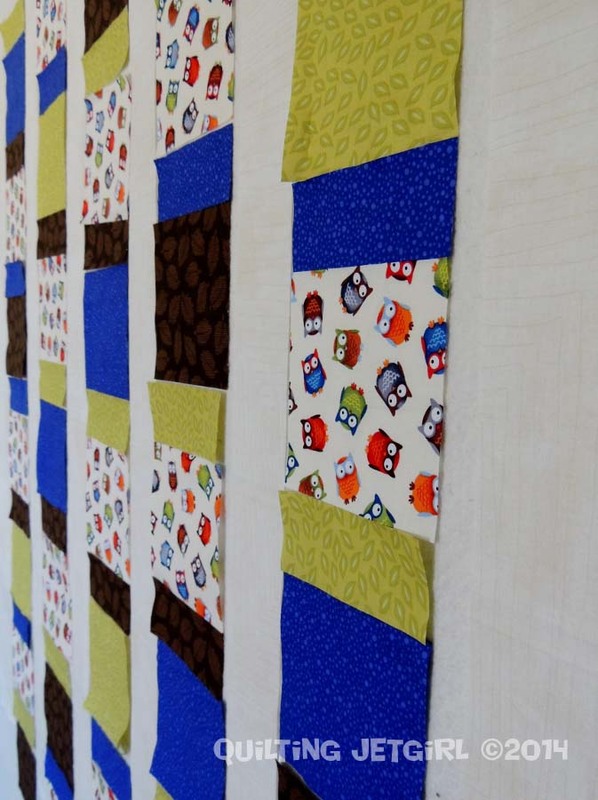 What a quick and cute baby quilt! I have a thing for owls, although I think it’s slightly fading. That’s what happens after 4+ years of people gifting you owl-everything! Thank you for the bloglovin tips, too! I’m going to have to follow myself to see how my blog displays, since I’m a wordpress user, too. Thank you! Nice quilt and tutorial! I’m a fan of the owls, I’ve got some owl scraps that a friend gave me and I haven’t found the ‘perfect’ project for them yet. I like how your fabrics all work together! cute quilt, I love the mixed sizes of the pieces, I’m going to have to bookmark this for future reference. Oh this is great boy quilt! So hard to find good patterns!